In the evening walk down to the harbor and enjoy a romantic dinner at one of the wonderful Coral Bay restaurants or stop for groceries and have a romantic dinner at home on the deck. The owners are artisans and this shows up in this home. This house has a paved access and great off the street parking. When you inquire and reserve Island Cottage you will work directly with the owner. We make sure your experience is personal and rewarding - all interactions will be with the owner or Tracey our on-island host. Air conditioning in the bedroom. What can I say but St. John was so much better than imagined. Island Cottage is a place we will NEVER forget... beautiful, peaceful and rich with memories. You have a treasure here! 'If you seek constant entertainment, pool parties, cocktails served all day, dancing in the club or nightly bar hopping, this is not for you! I have a high stress job and I found the perfect get away, not only St John, but this lovely 1 bedroom home. St John is a quiet, serene, laid back island. I found none of the usual Caribbean attitude here. My family takes a few trips every year and after visiting Hawaii, Aruba, St Kitts, Nevis, Nassau, St Lucia and Puerto Rico, this is, by far, the cleanest, friendliest and most beautiful of all the Caribbean islands. 3/4 of the island is a national park. Enclosed, but open to the sky shower. A beautiful spot with all the comforts needed and more. It was perfect for the 3 of us. We also enjoyed Coral Bay and the surrounding area. My husband and I loved our stay at Island Cottage. The cottage is clean and comfortable, and we appreciated having beach towels and chairs available for our use. 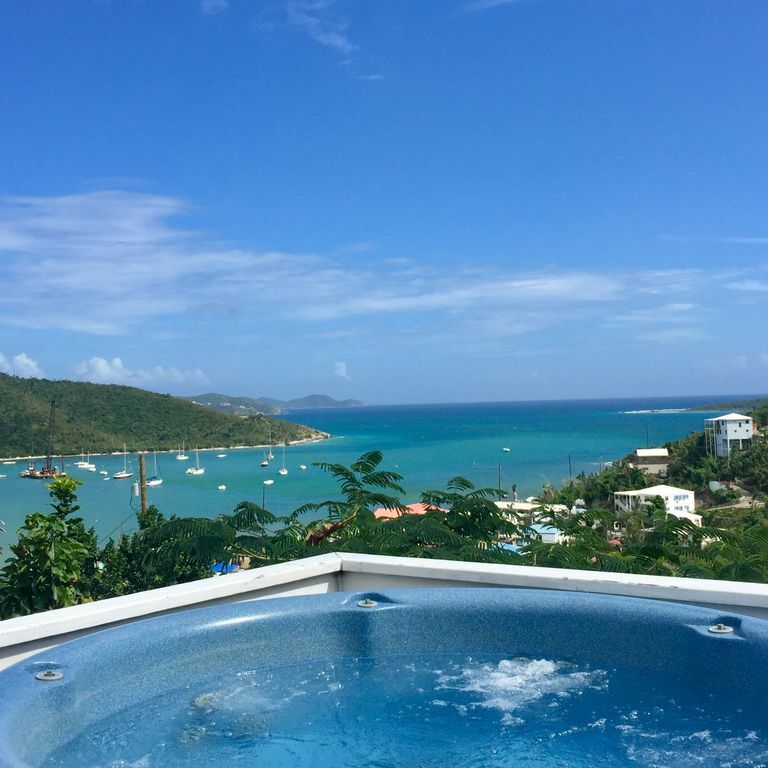 We found the cottage to be conveniently located to all of the north shore beaches as well as the more remote beaches on the east and south sides of St. John. The cottage overlooks Coral Bay, and we enjoyed drinking coffee every morning with a view of the harbor. It's easy to get to the restaurants in Coral Bay - we usually drove, but it is walkable (the cottage is up a steep hill, but it's definitely manageable if you're in decent condition). Ultimately, we choose to stay at Island Cottage because we wanted a quiet place to relax with a beautiful view, and we were not disappointed. We'd definitely stay here again if we return to St. John! Island cottage was the perfect place for my husband and I while staying in St John. We initially booked it due to the location being in Coral Bay and the amazing deck/views and they did not dissapoint. After exploring various beaches (which we basically had to ourselves) and hiking a few trails everyday coming home to cook and then relaxing in the hot tub while getting lost in the stars was perfect. Early mornings called for relaxing on the deck watching the sun rise. We did have a few issues with water however Sharon was extremely efficient in getting the problem resolved. St. John is still in disarray but the people are resilient and bringing their island back to life one day at a time. We will most definitely be back! This was a very good place to stay. Everything in the cottage was in good shape and very comfortable. The only two things I would have to say in the negative are that there was no internet yet and that there was a TV listed but there was not one there, even though it was stated that there was no cable I was hoping for one to hook up to by other devices. I really liked Coral Bay with it's good restaurants and nice people. One other thing is that the parking area for the cottage was very good compared to what I saw around it. I would have given it a five star if I had been told about the things that I expected but was not told about. Oh my goodness; we do have internet and you can hook up other devices. I’m so sorry that it wasn’t working for you. We didn’t know. I just had my manager check it and the router was not working. She installed a new one. If this ever happens again, please let us know so we can fix it right away. Thank you for choosing Island Cottage. I do hope you will return so we can show you we deserve 5 stars :-). The owners have done a beautiful job of bringing the island into this home. The view is great and the little island touches are welcoming. Overall, it was great! A couple things I would like changed in order to stay again--most of the windows had no curtains, which made it difficult to sleep in either the bedroom or the living room with the full moon lighting up the entire room. Also, we were only provided two bath towels and two beach towels for a five night stay. When I contacted the owner, she very nicely apologized and said it was a mistake, but when the housekeeper came by to give us two additional bath towels, she said she thought two towels would have been enough for five nights. With no washer or dryer on property or anywhere nearby, it seems it should be standard to provide enough clean towels--especially since it is very humid and the towels never dried in between showers. If the curtain and the towel situations were remedied, I would stay here again. If not, I would look elsewhere.